Federal's new load is been packed with innovations. With Flite Stopper pellets and a Flightcontrol wad, the performance of Federal's new Black Cloud will win waterfowler's hearts from coast to coast. 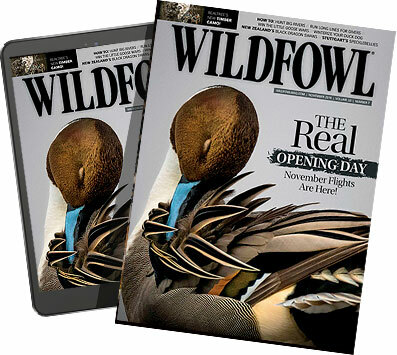 As previously reviewed in Wildfowl, the performance of the new Federal Black Cloud waterfowl steel shot ammunition is not a totally new subject to readers. At the time, we had moved through a South Dakota duck season, and as a part of that hunting year Black Cloud had been effectively tested against a variety of ducks. The results of those tests had been quite positive. Now, with the spring snow goose season approaching, the setup could not have been better in terms of gaining some early field information on effects of Black Cloud on the white birds. Because the new Black Cloud retains the special Flitecontrol wad, and two different pellet designs in the same load, getting data as to the basic retained velocity of the new shotshell ammunition would be a bit tricky. However, because I had enough reference ammunition on hand, the trick was to gain accurate data by way of my chronograph equipment, in this case the Oehler Chronotech Model 33. Two screens would be used for measurement because it required steel plate armor down range applied to both photo screens to make the equipment test safe. The exact laser ranged distance of the first test would be 40 yards. The test gun featured a factory modified choke. This was my go to gun for the upcoming goose hunt and I wanted to learn more as to its basic effectiveness when applied to the new Black Cloud goose fodder. With a 50/50 pellet count of 72 pellets in BBB steel as per the 3-inch 11⁄4-ounce load, and the other half the new Flitestopper belted pellets, I would be searching for the pellet velocity difference to the center mass of the pattern in the first load tested. Center mass (or core) will always produce the most uniform velocity because those pellets have not been kicked around in dirty air. This is an effect much like what a race car driver feels in heavy traffic if caught in the back of the pack. Each individual pellet sends out a stream of air behind it, and the new belted Flitestopper pellets develop additional drag with the belt of steel around the middle of the pellet, anything was possible according to the recordings of the chrono. Also, because the wad itself was in effect a sabot type design that would hold the shot over a short distance as a single slug, it would seem correct that target velocities would be greater due to this unique payload control system. Load number two would be a 11⁄4-ounce, 3-inch load of Black Cloud #2s in both shot types. Payload count in this load stood at 150 pellets. Muzzle velocity by the factory book was 1450 fps for a 28-inch barrel and modified choke was recorded at 1386 fps. From a bench rest and out over the screens, the first series of test rounds as applied to BBB Black Cloud produced the following string of numbers. These figures are the real time, exact velocity of the pellets as they crossed the photo cell windows down range. No computer generated textbook data here. Reviewing some previous chronograph data covering the BBB steel pellet loaded by Federal Cartridge just prior to the big move in muzzle velocity figures being heralded today, I found that at a muzzle velocity of 1320 fps again chronographed, the BBB steel crossed over the 40 yard screen at 786 fps on average. This gives the canister sabot Black Cloud load a 62 fps advantage over the standard wad delivery systems used by Federal at the time of previous tests. However, being that the old Federal BBB steel shot load was sent down range at a full 144 fps slower at the starting line, we can see that steel is a weak sister to anything save for pure lead or tungsten iron shot. It takes a good deal of engineering to make up for the lag time generated by all steel shot, and even this small edge given up by Black Cloud is noticeable in the field when paired with the new Federal Flite Stopper shot design as well. In truth, I was quite taken back by the close velocity comparison I observed between the old Federal load and the new Federal Black Cloud. I would have guessed that Black Cloud would have been far better able to generate more retained velocity/energy down range. Again, as I have stated time and time again when you're shooting something akin to a ball of porous iron, velocity alone won't count for very much. Shooting the #2 pellets in Black Cloud indicated that with a measured muzzle velocity a good deal lower than the BBB steel shot loads (1386 fps) the #2s go over the 40 yard screens at a uniform 746 fps When I rechecked older data that used a 12-gauge load of standard #2 steel at a muzzle velocity of 1369 fps I found that those loads sent the #2 pellets across the recording screens at 752 fps. If this all sounds very confusing, that's because it is. Measuring shotgun pellets in flight is tough business and requires a massive number of samples to cut through all the rough data and come up with accurate information. Today, the good news is that the computer will do that for us, where in the past, I spent days on end shooting for recorded velocity figures. Even with the ballistic programmed computer, we still must understand that shotgun pellets tend to have a mind of their own, and can be very unpredictable at best. Why is the new Federal Black Cloud any different from standard steel shot loads you're asking? Because by way of the pattern board and in the field test we see a clear and tight shot cloud that puts more shot on target. When patterned at 20 yards, the Black Cloud put all of its payload by way of a modified choke into a 14-inch circle. Even at that, most of that payload was pushed into an eight-inch hole that was all daylight at the center of the pattern core. I tend to believe that the sabot wad was still holding shot inside it at that range. Additional anomalies include spent wad distance from the muzzle--even at level pattern or chronograph shooting in excess of 57 yards--with all wads reaching at least 40 yards down range. The normal shotshell wad will expire at about 15 to 20 yards. Additional test effects included getting pellets over the three- by eight-inch photo cell window. If shot comes in too high, it won't be recorded in terms of its velocity, and if off even a slight amount, it will miss one screen and cause an error on the chrono's digital display. At times, it took several rounds to even gain a single velocity figure because of these problems and I attribute these events to the very tight sabot delivery system of the Black Cloud loads. ped with 3-inch #2s for the white birds of spring. I won't say that the evening hunt was too eventful, but I did manage to put a few loads of Black Cloud into the first snows ever taken with them. No drifters, sailors, or back flapping cripples here. In terms of exact ranges, we agreed by ranging passing birds that most of the shooting had taken place inside of 50 yards, with a stretch shot that had been clearly successful out at the 58-yard mark. This range application was a strained push for #2 steel, and by the next morning I had shifted to the BBB 11⁄4-ounce 3-inch loads when gunning cornfield birds. I pressed some of my shooting to the edge of the BBB's limits. Not because I wanted to blast useless holes into the sky, but because I wanted to push a new loads to its limits; that's what I get paid to do. The evaluation of any load requires that its outer limits of it performance be observed. That means we can pass along information to you, the hunter, that will assure you'll be able to get the most out of the selected munitions. In this case, I found that BBBs were a solid option in Black Cloud well out to 65 yards with no wind, and a possible 70 yards if all conditions were favorable. Again, down range chronograph testing shows that BBB steel at a muzzle velocity of 1320 fps will still produce an on target velocity of 579 fps at 70 yards. Believe me, this is an extreme edge in terms of basic performance, but the pellet speed is there if the pattern can hold up. Overall, I tend to think that based on this early testing that Federal Black Cloud is a step forward in the advanced development of standard steel shot ammunition. These loads will sell for the same price as better grade premium steel, not the high end price tag of tungsten based shotshell ammunition. That in and of itself will make this new waterfowl ammunition popular among duck and goose hunters. Federal will have these loads stocked with dealers for the fall of 2007.